When we first activate your Workplace"Workplace" describes the Autotask Workplace service in its entirety. site, default logos and a default color theme will be applied to your site and to your interfaces for Workplace OnlineWorkplace Online is the web portal that users within a team can use to access their data and administer their team., Workplace DesktopAlso known as the Workplace Desktop app, and in the context of this documentation, simply "the app," Workplace Desktop is the software installed on a computer that is responsible for synchronizing data between the local drive and the cloud., Workplace ServerWorkplace Server is a component of the Autotask Workplace service. It makes all your files accessible through Workplace while retaining local, centralized data storage so that your data is also available via your local area network (LAN). The Workplace service keeps all data on your LAN accessible internally and in sync with Workplace., Workplace MobileWorkplace Mobile is the Workplace application designed specifically for the various mobile platforms, providing access to Autotask Workplace., and all emails generated by the system. On the BrandingBranding is the ability to customize your team name, logos, support information, support emails, and color theme in Autotask Workplace, Desktop, Server, and Mobile. page, you can apply your own branding to your team Workplace interfaces and emails at any time. You can set color theme and logo defaults to apply to all Workplace interfaces, or you may customize these items for each interface (Online, Desktop/Server, and Mobile) individually. Emails will display the logo you select, but will not be affected by color scheme changes. Workplace Desktop and Server will display the branding changes. If you do not see the changes within 15 minutes, quit and relaunch the application. Workplace Mobile for iOS requires a login event to trigger the branding changes (log out within Workplace Mobile, or upgrade Workplace Mobile, or force quit and relaunch Workplace Mobile). Workplace Mobile for Android needs to be re-opened for the branding changes to show. The Branding page also allows you to customize the logo and other text for activation, alert, and notification emails sent from Workplace in multiple languages. The team name you enter on this page will be visible to your users in their Workplace Online interface and when they click on support links in Workplace. You can also customize the support information displayed in your users' Settings area. This page provides detailed previews of your changes, so you'll know exactly what you're changing and what your customers will see. Changes are applied immediately; your new team name appears in the top right corner of the page. This information is displayed when users click the Settings link in the upper right of the Workplace Online interface. Unless a different logo is defined for a specific platform or area, the default rectangular logo will display in Workplace Online, Workplace Desktop, Workplace Server, and on system-generated emails, and the default square logo will display in Workplace Mobile and the linked teams menu in Workplace Online. To select a new logo, click Browse. Optionally, crop the uploaded logo by adjusting the crop guidelines on the image. The image preview will reflect your changes. Click Save in the popup window. Click Save on the Branding page to apply your changes. If you are changing the logo for a specific interface, remember to click the links under the preview pane to see the logo on different pages. Unless a different color theme is defined for a specific platform, the default color theme will be applied across all platforms. If you are selecting your default color theme, the icon appears on the system default color swatch, which is medium blue. 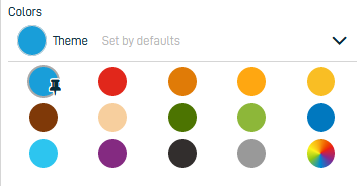 If you are selecting a color theme for a specific interface, the icon appears on the color swatch of the default color theme you have selected if it is different from the system default. To select a predefined color theme, click a color swatch to select a theme based on that color. To select a theme based on a custom color, click the multicolored swatch and enter a hex code or move the slider in the rainbow bar and place your cursor in the square box to select the hue and color depth. Then click Select. If you are changing the color theme for a specific interface, remember to click the links under the preview pane to see the theme on different pages. This logo will be visible to your users in the upper left corner of their Workplace Online interface. To edit, please refer to Change a logo. This logo will appear in the Linked Team menu in Workplace Online. This logo will be visible to your users on the Workplace Online login page. To edit the logo, refer to Change a logo. This theme will determine the display colors for Workplace Online. To edit, please refer to Change a color theme. Review your edits in the preview pane to the right. Remember to click the links under the preview pane to see your changes on different pages. Branding display in Workplace Desktop and Desktop Server requires version 7.2 or later. This logo will be visible to your users in the Workplace Desktop and Workplace Server interfaces. 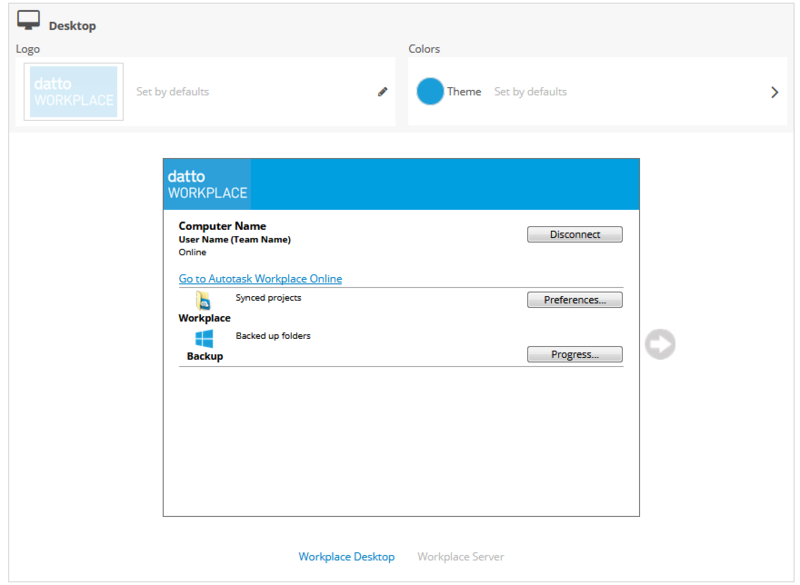 This theme will determine the display colors for Workplace Desktop and Workplace Server. Remember to click the links under the preview pane to see your changes in both Workplace Desktop and Workplace Server. Branding display requires Workplace Mobile 2.3 or later. This logo will be visible to your users in the Workplace Mobile interface. 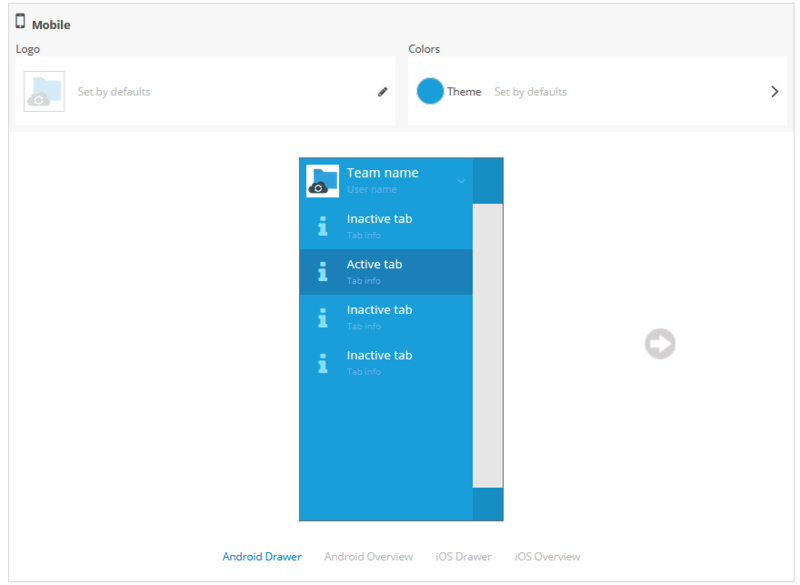 This theme will determine the display colors for Workplace Mobile. Remember to click the links under the preview pane to see your changes in different operating systems. This logo will be visible in the system-generated emails sent automatically from Workplace. To edit the logo, please refer to Change a logo. Click the Add a new language link. Click a language to select it. When do users get this email? Activation Email Users will receive this email when their Workplace account is created. They must click the button in the email to activate their Workplace account. Alert Email Users will receive this email when Workplace sends them an alert message informing them of action that they need to take, or critical Workplace-related information such as a password reset. NotificationA notification is an automated message to alert specified users of a particular event. Notifications are a mechanism for collaboration. Email Workplace uses this email for system-generated communications, such as when an item is shared with a user, when a comment is added, when a scheduled report is delivered, etc. Repeat steps 4 - 5 for each language you wish to add. To remove a language, click the X icon to the right of it. Click the Reset to Default Branding button. Click Reset Default Branding in the confirmation popup.